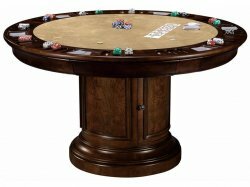 HM699-012, Ithaca Large Games Table, by Howard Miller. On select veneers and hardwoods, Howard Miller's Ithaca Games Table comes beautifully finished in a lightly distressed Hampton Cherry finish. Convenient storage in the base of the Games Table for additional accessories. NOTE: Simple assembly is required. Ithaca Club Chair (HM697-012): Comes designed with brown faux leather back rest and seat cushion. Metal base comes with a wood covering. Lightly distressed, with a Hampton Cherry wood finish. Please Note: Optional Club Chairs are only sold in conjunction with the games table.